A 24″ deep Scoop door canopy shown in the black painted finish. The 6’8″ high x 18″ wall trellis panels and 18″ circular steel planters are shown in the aged zinc galvanized finish. 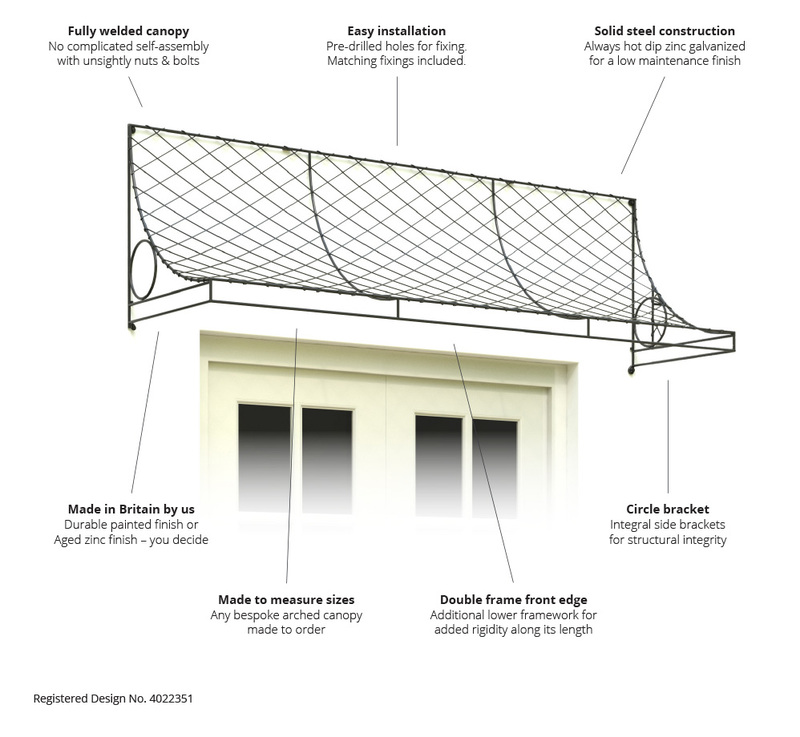 Our wirework lattice door canopy is hot dip zinc galvanized before painting matt Black or Grey, or can be Aged to achieve a mellow zinc patina that looks like a lead roof. We can reduce the 28” high roof to 15” if there is limited height above your door and can modify the width of the door canopy to suit your doorway. Our pair of wirework door canopies and matching wall trellis panels look perfect over our French doors and they really were easy to install. We can arrange delivery throughout the United Kingdom. We use an independent courier that offer next day delivery. Canopies are from £39.50, the price will depend on the number of items and weight of your order; we’re happy to provide a quotation prior to placing your order. Once ready, we will contact you to arrange a convenient date for delivery. For full delivery and payment details, please see our terms and conditions.